The quake jolted people awake that April morning in 1906 as glassware crashed to the floor, animals cried out, and chimneys turned and fell. While San Francisco’s Great Earthquake and Fire on April 18 did widespread damage, San Ramon Valley communities were spared the devastating fire. The Earthquake Report by Arthur Lawson, published in 1908, stated that most Danville chimneys were twisted or cracked and, in San Ramon, a saloon slid entirely off its foundations in a northerly direction. The Olsson family in San Ramon spent the next nightson their sleeping porch because of the many after-shocks. Astrid Olsson, who was 8, later recalled the eerie glow of the San Francisco fire over the western hills. 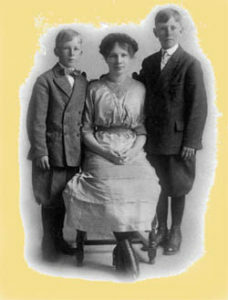 Astrid Olsson, shown with her brothers Edwin (left) and Ruben around 1909-10, was 8 years old during the Great Earthquake of 1906 and later recalled the eerie glow of the San Francisco fire over the western hills. “As the day wore on the western sky was red and then black with smoke from burning San Francisco,” was another observation by Vivian Coats. Normal life came to a standstill. John Morss of Alamo had business in San Francisco but instead the family went to Oakland and watched the fire. William Meese postponed the highly publicized April 26 opening of his new group picnic area, Ramona Park, which was located southeast of today’s Greenbrook Drive and Camino Ramon. Quake refugees John Vecki and his family settled in Danville. They bought the Cohen/Chrisman house at 169 Front St. and he became the valley’s only dentist. Many refugees moved permanently to Oakland and Berkeley. Saved from the worst destruction, valley organizations helped out. The Danville Grange sent infant suits, chicken broth and 100 dozen eggs, and the Ramona Club sent clothing and groceries while the Rebekahs collected other supplies. One poignant story was later told by Elsie Fereira Valentine, who lived in the Fereira house in Bollinger Canyon. Because her family was concerned about their chimney’s safety, they had an expert check it. The chimney was pronounced safe but, in the fall when the family lit a fire, the fire escaped from the cracked chimney and destroyed the whole house. The Great Quake left its mark on all of Northern California. This article first appeared as a column called Presenting the Past in the Danville Weekly.